Schiller Park, IL. 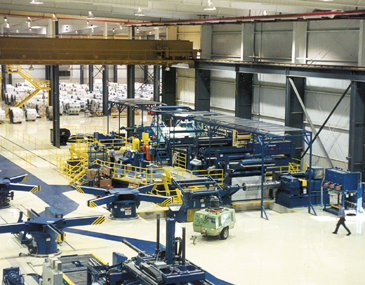 - January 26, 1999 - Braner/Loopco is pleased to announce the completion of a large coil slitting and slit coil packaging project at "Regional Steel Distribution Center of Michigan, LLC" (RSDC), in Holt, MI. RSDC is a gigantic 625,000 square foot greenfield coil processing center, a joint venture between Itochu International Trading Co., NY, NY, and Kasle Steel Corp., Detroit, constructed just outside of Detroit, MI. RSDC will supply six General Motors stamping plants with 1.2 million tons of processed steel sheet annually. 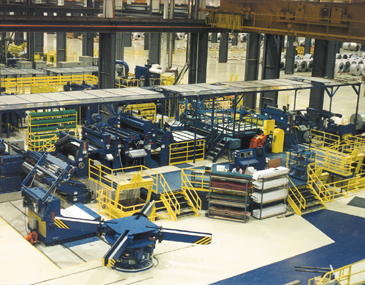 It is reported that the RSDC "megacenter" is the largest automotive sheet processing plant ever built in North America. RSDC processes its coils on two (2) Slitting Lines; a 90,000# x 77" x .135"/.010" x 1,200 FPM Double Loop "Turret Head" Slitting Line, and a 90,000# x 84" x .135"/.010" X 1,200 FPM Double Loop "Turret Head" Slitting Line. Both lines are capable of processing light gauge bare cold rolled steel, pre-painted, and deep draw surface critical hot dipped class 1 exposed automotive sheet coils. An Automatic Slit Coil Packaging Line capable of separating, downlaying, strapping, and palletizing 20,000# x 24" wide x 84" O.D. slit coils handles the output from the two (2) Turret Slitting Lines. Braner/Loopco designed, manufactured, and installed the two Slitting Lines and the Packaging Line at RSDC on a "turn-key" basis. Both the 77" and the 84" Turret Slitting Lines are specifically designed to process the fragile deep draw automotive coils without strip surface damage. Braner/Loopco's patented non-marking "Duplex" Roll Tension Stands with DC drag generator brakes and 800 line horsepower provide the tension to recoil slippery pre-lubricated slit material into straight sided 84" O.D. coils. An Inspection Station with special lighting allows RSDC to monitor and inspect the surface of the coils during slitting, assuring RSDC's customers that the coils produced from the two lines are free of surface defects. Understanding that even the best prime coils may have certain shape defects such as "center buckle" and "wavy edge", both Slitting Lines lines are equipped with Braner/Loopco's patented microprocesssor controlled "Cluster Levelers".